Facebook Phishing attempt, don't get fooled. 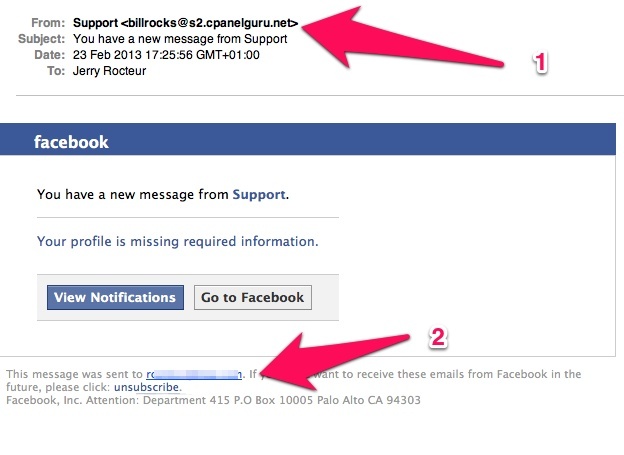 This morning I received a mail appearing to come from Facebook, the subject says "You have a new message from Support", please look at attachment below but the mail says it comes from support and that my profile information is missing. How can you tell this is not genuine and that it is a phishing scam. You can go further and head over to http://www.dnsstuff.com/ and check the email address, hostname and IP addresses to see where they come from, the mail comes from a data center in Michigan and nothing to do with Facebook at all. Don't be fooled. BE CAREFUL before cliking on a link in your emails.